The Maldives on Wednesday appealed the aid of major international banks to establish safe waste management systems and protect the environment of the archipelago. The government plans to launch a USD 100 million (MVR 1.5 billion) project next year to solve the environment problems facing the Maldives, with the highest priority given to disposal of waste taken to the waste management island of Thilafushi close to capital Male. Under the “Saafu Raajje” (Clean Maldives) campaign launched by the Ministry of Environment and Energy, the government has commenced seeking financial aid for its waste management project. Speaking at a ceremony held at State Electric Company (STELCO), Minister of Finance and Treasury, Ahmed Munawar, stated that various foreign entities have expressed interest in assisting the government’s major project to establish safe waste management systems across the Maldives. He noted that the government has allocated over USD 10 million in the State Budget 2017 for waste disposal alone. Noting the government’s target of bringing major developments to the greater Male region and President Abdulla Yameen Abdul Gayoom’s vision to settle 70 percent of the population in that area, Finance Minister Munawar stressed the importance of establishing a quality waste management system in the vicinity of the Maldives capital. However, he admitted that the allocation for waste disposal in the state budget alone would be insufficient for a complete solution. “I personally met with the top executives of banks. The [talks during the] meetings made their interest in this cause evident,” said Minister Munawar during the ceremony which was attended by top members of four banks. The minister also underscored the importance of efficient waste management to prevent damages to the Maldives’ tourism industry, which accounts for the majority of the nation’s economy. Environment Minister Thoriq Ibrahim also reiterated that lack of safe and efficient waste management system is one of the biggest challenges faced by the Maldives. In his talk, he shared the government’s efforts to seek solutions for waste management, especially in Thilafushi and the southernmost atoll of Addu, with the banks' executives. 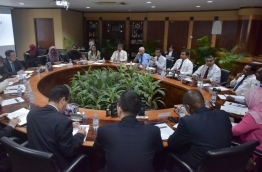 Top executives of the World Bank, Asian Development Bank (ADB), Asian Infrastructure Investment Bank (AIIB) and Islamic Development Bank as well as officials of various state institutions participated in the meeting.